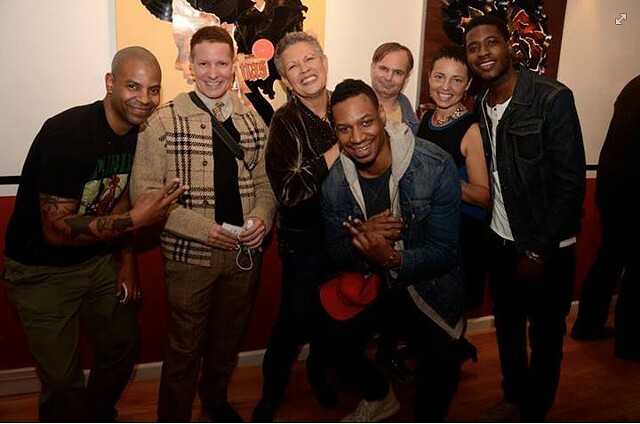 Exhibition artists: Margaret Rose Vendryes (center), Walter Lobyn Hamilton, Linus Coraggio, Ruben Natal San Miguel, Lance Johnson, Anthony J. Thomas, & Daren Chambers. Also pictured is Leanne Stella, Art in Flux founder and director. TCA Margaret Rose Vendryes and her African Divas, Yaka Tina, Igbo Grace, Ejaham Chaka and Ekoi Whitney are featured in the exhibition.